Limelight Marketing Systems - Are You Listening To Your House? Are You Listening To Your House? Ignore some of these signs and you may end up with major issues. We tell you which are normal and which are cause for concern. Your home is trying to tell you all sorts of things. The way it sounds; the way it smells. And there are plenty of visual cues to tip you off that something isn't right. "Everything is moving all the time, expanding and contracting at different rates, reacting to heat, rain and wind. A house is moving and breathing," says Tapley Dawson, a partner at The Home Doctors in Novato, California. In other words, a house is something you've got to take care of. Dawson recommends that you do a good walk around the house every fall before the rainy season begins, checking for cracks, clogged gutters or anything that just doesn't look right. That way you can catch problems early. If you own an older home, you should do a thorough check in the springtime as well, since those homes are prone to more damage. "You can't just live there blindly and assume it's going to be all right," Dawson says. "You have to participate and be active. The whole house needs love." The biggest enemy in a house is moisture. You want to keep it out, and nature is constantly trying to force it in. It's the cause of things like rotting wood, termites, cupping floorboards and, of course, mold and mildew, none of which you want in your house. "If you think about the materials in a home - wood, carpet, tile - they're meant to be inside the building envelope. So most problems have to do with moisture or something getting into that envelope," Dawson says. You see: Dark spots on the walls, ceiling or edge of carpet. Cause: Darkness on the carpet around the edge of a room that won't vacuum up, or any dark spots you see on drywall mean too much moisture is getting in and mold or mildew is forming. You could have a leak somewhere, from the roof or from a window. Or you could just have a lot of moisture lingering around. "We live in a damp world," says Dawson. If you have a north-facing wall without insulation, when warm, moist air from the inside hits that cool wall, moisture will form. "That's why you always want to run your fan when you cook and when you shower," he advises. Who to call: A home repair specialist can help determine if there's a leak and where's it coming from. He or she can usually then make recommendations to call a roofer if needed, or a general contractor to replace severely damaged wood and other materials. You see: Bubbling, flaking or cracking paint. Trapped moisture can occur on ceilings, on walls, around windows and on trim and molding. "If you see it, it ain't going away," says Ralph Stow, a contractor at the Dallas Renovation Group. "It's there for a reason." Moisture is somehow penetrating from outside or even from a leaky pipe or A/C unit. The paint might be "alligator-ing or checkering below windows in the corners," Dawson says, which means there's a leak and water is getting into your stud bay. This can cause mold and wood rot. Who to call: A home repair specialist can help determine the source of the leak and how to fix it. A plumber, general contractor, roofer, mold removal specialist or water damage professional may be needed also, depending on the problem. You see: Dripping from a small pipe outside a main living window. Cause: In places like Texas, where air conditioners crank almost all year long, a lot of condensation occurs. Most A/C units have a galvanized metal pan to catch condensation should the primary drain line get clogged. Many contractors, including Stow, will run a secondary drain line that comes down from the roof over a main living space window, so homeowners can see the dripping. Dripping means there's already a clog and the system is using its emergency backup. "If that emergency line gets clogged, the pan will overflow, and you'll have a major problem," says Stow. In fact, if you see a lot of moisture anywhere around a furnace or A/C unit, there's potential for water damage. Who to call: An HVAC specialist. You see: A light or popped-out button on your socket, and an appliance has stopped working. Cause: Oftentimes this is due to a ground-fault circuit interrupter (GFCI), which helps prevent electric shock from compromised wiring in electrical appliances. Basically, when electricity is going where it's not supposed to go, the fault circuit pops, shutting off electricity through the socket. All you need to do is push the reset button. If it doesn't reset, then there's something wrong with the outlet. Keep in mind that many GFCIs can control multiple outlets. So if an outlet stops working, look for one with a GFCI nearby and hit the reset button. Who to call: If resetting doesn't bring power back to the socket, call an electrician. Cause: This is not the same as when a light dims while you're vacuuming or using a hair dryer, which is normal. If you see a pronounced dimming and brightening, make sure the bulb is screwed in all the way. If that doesn't work, it can also be a bad socket, which can be a potential fire hazard. Who to call: An electrician. You see: A black line opening up on the bottom of an exterior wood door. Cause: This often occurs on an exterior French-style door where two portions of wood meet near the bottom. Wind and rain can drive moisture under and into the door if it's not properly sealed and installed. The paint should be even on the door, with no spacing anywhere between the pieces. If you see a space opening up, the door is on the road to failure, Dawson says. "Moisture goes in there, and it's a domino effect," he says. "Once moisture starts expanding and contracting, it breaks the joint, and the process starts. Wood doors and wood windows are hell. They require a lot of maintenance." Who to call: You may be able to fix this yourself with some caulk. When in doubt, call a home repair specialist. Cause: This could be an indicator of dry rot. Wood should look smooth. If you see wrinkled or wavy wood, or if your trim or siding looks different than other parts, it's cause for concern. This mostly affects the exterior. Who to call: A home repair specialist. You see: Insect wings on windowsills or in spider webs. Cause: Don't panic, but this could be a sign of nearby termite swarms. It doesn't mean you've got termites, but if you've already got moisture problems, like a black look on the walls or bubbling paint, you might want to call a termite specialist. Moisture attracts termites. It's hard to tell inside the walls, but if you see any mud tubes coming out of the walls or on any pieces of wood, you've got termites. Who to call: A termite professional. You see: Black streaks or black circles around nails on hardwood floors. Cause: This most often occurs near doors. If you've got an old home with exposed nail flooring and you see blackness around those nails, chances are that you've got moisture getting underneath the door sill, and it's corroding the nails. If the wood is cupping up, the problem is really bad. Who to call: A home repair specialist to do the preliminary fix, then you'll need a flooring specialist to refinish the area. You see: A foggy window. Cause: This happens on older dual-pane windows that have argon gas in the middle. If the seal becomes broken, moisture builds up and fogs. You'll likely need new windows. 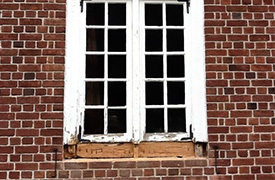 Who to call: A window repair specialist or general contractor.